My name is Beckett Tucker, I own a bar in Leichhardt which is in Sydney, Australia called Vanilla Room. It is pretty good and we take our drinks here very seriously in fact I import some liqueuers especially for my bar. We love what your doing and think you are a champion, so much so I am prepared to pay for your flight to Sydney to have your final drink here. I am not kidding I will even put you up at a hotel in the city and you could if you want enjoy the best new years eve celebrations in the world. Email me back if you are interested. Or call me on + 61 2 407 904 607. That is my cell number. is ok we with you the offer still stands and we would love to have your wife to Vanilla Room and Australia as well. Your last email was great, we all sat around and read it last week one night after work. And let me tell you a little thing about Vanilla Room Margarita's. We are famous for them. There is no substitute for fresh lemons and limes. Although I love tanquarey I love martin millers gin even more. Anyway Dan my good Man there you have it. 5 star accomodation while you are out here. I'll even take you and your wife for a personalised trip up to the Hunter Valley Wine Region. How could you say no. Sleep on it, drink on it, either way let me know, keep in touch. We'll chat soon. can put a voice to an email. Please by all means mention us that would be really great, infact I was going to do a press release in Sydney if you are ok with that I will of course send it to you before we release it for your approval. My plan is to fly you both into Sydney a few days before New Years eve have a few drinks at a few places in Sydney and then finish with ours on New Years Eve. We are going to have a big party to celebrate the occasion. I hope this is all ok with you. will chat soon when I have some more solid info for you. Since then I have heard nothing despite numerous emails asking if there was any further information because I really did have to start making plans on my end. I even asked him to let me know if the offer had been withdrawn so that I could make other plans. Nothing. I can only assume, at this point, that what I and the Mysterious Chinese Woman had looked forward to with great anticipation is no longer to be. I haven't heard from you for quite awhile regarding my visit to Sydney and the Vanilla Room. Are we still on for this? I really do have to begin making some advance plans if we are. Also, I am fast approaching bar number 900 and the fellow who did the Associated Press article for bar number 500 said he will probably cover it. I know he will want to know my plans for bar number 1000 because he has already asked me about it. I have told him my plans to go to Sydney but also told him that nothing had been finalized. He said to let him know when things were. You may recall that he said the Associated Press in Sydney would more than likely cover my visit to the Vanilla Room. He said he thought it would make quite a story. If there has been a change in plans I would understand, but please let me know for sure one way or another. Thanks so much and, again, I certainly appreciate your most generous offer. As I move toward my final countdown toward my 1000th bar I am afraid that I will have to reject your offer, if, indeed, it still exists, to come to your bar in Sydney. As you know, I have tried repeatedly to get in touch with you to make definite travel arrangements but have heard nothing from you since August 11th. This is despite the fact that in one email, dated June 28th, you said that you were meeting with your travel agent that very day to make final arrangements and would be letting me know what they were. I really cannot express how disappointed I am with this turn of events. All the way up until August 11th you continued to assure me that everything was still on track. As you can imagine both my wife and I were very excited about this trip. Why you would extend an offer and then do nothing to follow through on it I simply cannot imagine. As you may well imagine, I also turned down several other rather generous offers to visit bars for number 1000. For you to have made your offer without actually honoring it is, in my opinion, simply reprehensible. To not even have the courtesy of notifying me that the offer was no longer on the table is, in my opinion, even worse. I did what I could on my end to publicise your offer, in print, on the radio, on television. I now truly regret that I did this but, as you can imagine, I will try to make amends. You have certainly managed to throw a lot of cold water on what has been a very enjoyable journey and have managed, single-handedly, to turn its end into something less than the enjoyable finale both I and my wife, and even the Mysterious Chinese Woman, had been looking forward to with great anticipation. All I can say is that Mr. Beckett Tucker has done an excellent job of throwing cold water on what has been a most enjoyable journey through 1000 bars. Of course, I am not even sure if he even gets emails at this address anymore. All I know is that he doesn't answer mine. Friends of mine from Callicoon came down to the city for a week-end’s adventure. This is an annual event for “the girls,” but I and the Mysterious Chinese Woman got invited along for an evening’s entertainment. We started out with cocktails in their hotel room and then had dinner at the Blue Fin. The bar there was too packed to settle in for a drink so we headed back to the Sofitel Hotel and stopped at the bar there. Shirley, co-owner of Fred and Shirley’s Dollhouse Bar in Callicoon, came down to Manhattan with three of her daughters, Kathy, Laurie, and Mary and hooked up with her grand-daughter Liz and her partner Peter and a friend of Liz’s, Diane. 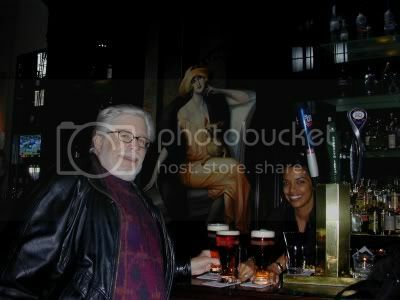 Most of us stopped at Gaby’s Bar for a nightcap. Gaby’s is an elegant bar, richly decorated with marble , dark wood, and plush leather. The style is a combination of art-deco and French. White ceiling is ringed with paintings of the Eiffel Tower and other French landmarks. The area behind the bar is dominated by a large painting of an elegant French mademoiselle. Opposite from the painting is a large clear glass painting that separates the bar from a lounge area. Painted on the glass panel is a black outline of the French mademoiselle in the painting. The L shaped bar has dark wood sides. The bar stools are padded leather. The dark wood cabinets behind the bar has glass shelves displaying their liquor bottles. The shelves have mirrored backs and softly back-lit. Small televisions are mounted on either side of the bar. The lounge area has little green marble tables and a long wrap-around couch covered with a leopard-skin patterned fabric. Above the couch is a spot-lit shelves with clear glass vases containing odd shaped vegetation, some looking like oversized artichokes and asparagus. Framed abstract paintings decorate the walls. 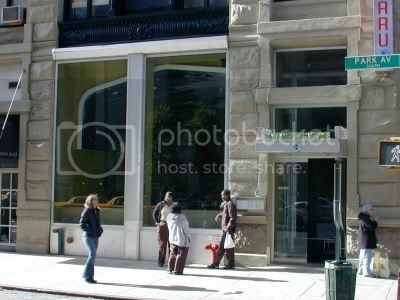 A large glass door trimmed with brass opens out onto the street. I had a glass of beer but don’t remember what kind. Today I broke that that 900 bar mark and began the countdown through the final 100. When I started this adventure I had no doubt that I could successfully complete it, but I have to admit, looking back, I am somewhat amazed that I made it this far. I have come to realize that once I hit my final bar it will be with a sense of both pride and relief. I decided the Mysterious Chinese Woman should be along for this semi-milestone event so I picked some fancy bars to visit. These are all fairly new on a bit of a stretch where there never really used to be much in the way of bars and restaurants, Broadway between 14th and 23rd and just adjacent to it.. 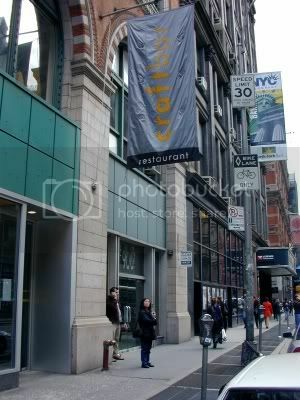 It is hard for people to realize now, but the whole Union Square area was really hard scrabble not all that long ago. I mean Union Square Park was rift with drug dealers and prostitutes even during the day. Nobody was putting up anything nice in this area at that time. How things do change. A lot of people remember what Alphabet City was like and how much it has changed. In fact you can still see a few remnants of what it was like if you look hard enough. But it is amazing the number of people I talk to have no concept of what Union Square was like. I am really getting to be an old geezer. If I start talking about how I had to walk a mile to school in sub-zero weather and the driving snow just buy me a drink and send me home. Oh, by the way, did I ever tell you about how I had to walk a mile to school in sub-zero weather and the driving snow? 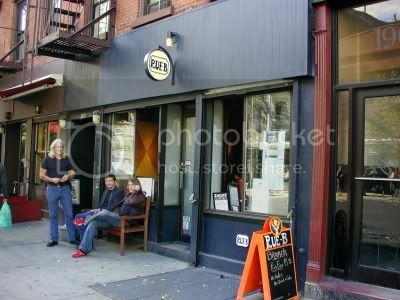 A great place on Broadway between 19th and 20th. Great if you don’t mind paying $11 for a bottle of beer. Even for a Hitachino While Ale from Japan that is a bit, shall we say, pricey. The “cheapest” beer in here was a Stoudts from Pennsylvania, and that was $7. The Bombay Martini at a mere $12.50 seemed like a steal in comparison. This is a nice looking place though with a long bar made out of black slate, missing only a foot rest of any kind to make it perfect. The chairs were molded plywood and metal and were surprisingly beat up. The bar back is fairly stark, mirrors and dark, almost black shelves for glasses and tiered shelves for the liquor. Cooling units with black doors sat down below and there was also ample storage for wine. There is a black metal catwalk above the bar and major climate controlled wine storage up there. The catwalk wraps around to the right and back of the bar and it looks like they must have just gotten in a large shipment of wine because that area was strewn with empty boxes. Small spotlights hang from the underside of the catwalk and illuminate the bar area. The walls are a combination of orange, white, and deep rose. There are little tables up front along with gray banquettes in a large nook directly opposite the bar. Pictures of fat ducks, probably about to become someone’s dinner, adorn the back wall of the nook. There is also a good sized dining area with larger tables decked out with white tablecloths and fancy place settings. A place where you would go to impress a date or schmooze a client. They do have an impressive menu, mostly French. Bar Man ignored the “Drink Specials” listed on the blackboard that included a Ginger Martini and an Apple Spice Manhattan and had his standard Bombay Martini, up with a twist. 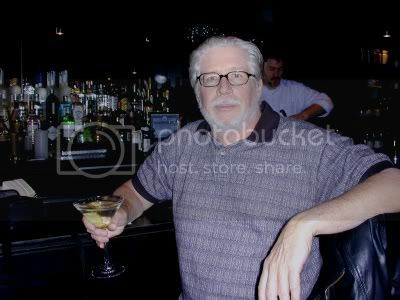 If Bar Man ever opened up a place of his own it would be modeled on a classic 1940’s jazz club and you wouldn’t be allowed to have drinks like an Apple Spice Martini, unless you sat in the children’s section. This place, on Broadway between 20th and 21st, evokes the feel of some kind of a British bar in colonial India or someplace equally exotic. Bamboo ceiling fans spin languidly, rattan chairs surround small round tables with metal tops, the floor is made up of small cream colored and brown tiles. The bar also has a metal top with a wooden front and a brass rail. Large jugs of vodka over various kinds of fruit (pineapple slices in the one in front of me) sit on the bar and each jug has a spigot on the bottom so these are not just for show. There is a single silver cylindrical beer station protruding from the bar and it has two unmarked black-handled spigots. Lots of lamps with black bases shaped like the Washington Memorial (or the Foshay Tower, for those of you familiar with Minneapolis) and square woven bamboo shades or some fabric made to look like that also sit on the bar. Almost too many of them because they, along with the jugs of vodka, make the bar feel a bit too cluttered. I sat at one end under a large tropical plant of some kind in a very large cylindrical frosted glass vase. The Mysterious Chinese Woman couldn’t identify the plant because it hadn’t flowered yet but she went into great detail explaining why the bright green leaves were configured the way that they were. The bar back is just a set of coolers with metal doors and wooden shelves in the middle. There is a long rectangular wood framed mirror and shelves holding liquor mounted on the wall above the coolers. The walls look like wallpaper that is meant to convey the feel, again, of very finely woven bamboo. There is a dark wood shelf sitting directly on top of the coolers and this holds bottles of wine and liquor as well. Lots of lights with round shades made out of the same fabric as the ones on the bar hang over the area behind the bar and similar lights are mounted on the walls. The guy next to us at the bar was eating a pasta dish of some sort and the Mysterious Chinese Woman asked him how it was. She has a way about her because he immediately offered her some to try. Surprisingly, she turned him down. He said it was delicious though. He must be a regular because he also told us how much he enjoyed what he had last night when he was here. 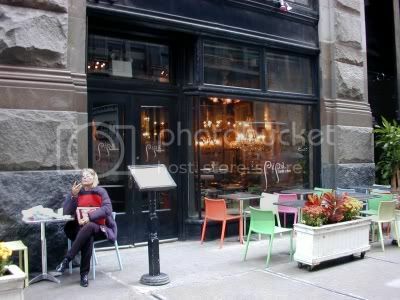 If you visit I would recommend you get one of the little tables in the enclave next to the window up front. 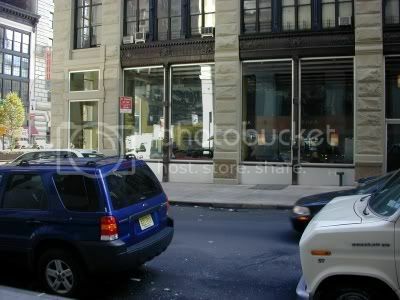 That looked like the neatest place to sit and you could look out at busy Broadway. I had a mojito, quite good, quite refreshing. This place is just off Broadway on 19th. This is the closest thing to a Spanish “cave bar” that I have seen here in New York. They even have one of those plastic covered tapas displays on the heavy, brown cement bar. Of course, being New York, they weren’t about to give them away for free. The ceiling is covered with chandeliers of all shapes and sizes. However, because this place is affiliated with ABC Carpet, they all have price tags hanging from them. In fact just about everything that isn’t nailed down, and some things that are, have price tags hanging from them. It does tend to detract a bit from the ambiance. The walls are old brick with what looks to be artificial stone in places to make it look like the place was built into a cave and they, for the most part, are also covered with mirrors (for sale). 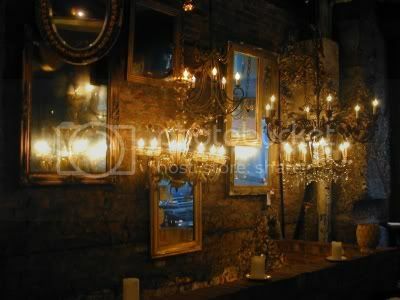 Behind the bar are three distressed looking mirrors in old wood frames (also for sale). Below them are coolers with metal doors (not for sale) and on top of them are tiered shelves of liquor (for sale). This is a fairly large place and the walls are covered with mirrors (for sale). The open kitchen area is to the right of the barand there is a large, heavy wooden table surrounded by dark wood chairs with green seats (the same as the ones at the bar). Fat white candles sit on top and add to the somewhat medieval look to the place. The floors are old wood and the ceiling is old looking narrow wooden beams. If you can ignore the price tags, by all means pop in. The Mysterious Chinese Woman and I shared a pitcher of Sangria before I toddled and she poofed, this time in a cloud of wine colored smoke. A pleasant day with another three bars under the belt and, ta da, only 98 left to go. I took the East Side subway up to 103rd just to see what I could see. 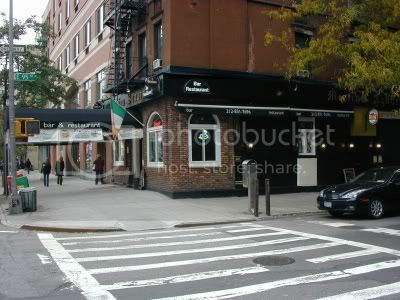 Then I walked over to 2nd Avenue, thinking I would find a few bars over there. Well, there weren’t any, or at least none that I could see. I had to walk down to 95th before I got my first respite. After a dry patch I came across this cheerful little place on the corner of 95th and 2nd Avenue. It is an Irish bar, at least going by the brogue of the bartender, and was festooned with cobwebs and spiders for Halloween. It looked like it was fairly new with a lot of blond wood. Maybe it was just newly refurbished because the bar and bar back looked a bit older but recently refinished. It was a good sized wooden bar with a foot rest. The bar chairs were darker wood with red seats. There are two beer stations on the bar with eight spigots each and they had a decent selection of beers. Orange shaded lights hung over the bar. The bar back has three recessed arched mirrors with tiered shelves in front holding the liquor. The arches at each end are ringed with small white lights and the one in the center has a plasma television in front of the mirror above the liquor. There are wooden shelves holding glasses and cabinets down below with a refrigeration unit with glass doors in the center. The bottled beer was stored there along with way too much Smirnoff Ice. A cute little twinkly witch sat on top. 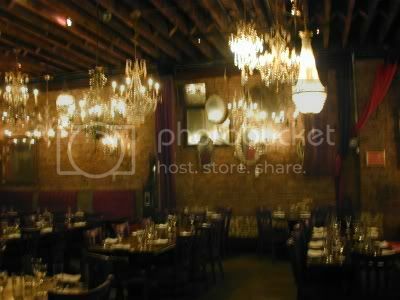 The walls are brick and banquettes with pink cushions line the wall opposite the bar. A partition separates that area from the bar and there are small tables and chairs along each side. There is a pool table in the back covered with black felt. Some guy was trying to learn the rudiments of blackjack at the end of the bar and really didn’t seem to be getting it, at all. He said he was trying to learn before going to Atlantic City this week-end. I opined that perhaps he should stay away from the tables until he had a better grasp on the game. Well, this apparently made me his buddy because he then decided engage me in a very prolonged conversation touching on a wide, very wide, range of topics. It turns out he was a cabbie and I can just imagine what his customers go through. The hi-lite of our conversation was when we got on the subject of basketball he wondered how anyone could name their son Magic. He couldn’t quite grasp the thought that Magic was just a nickname and his parents actually named him Earvin, after his father. I am glad we didn’t get to a discussion about how Kobe got his name. 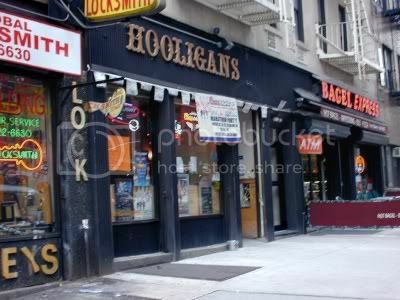 An aptly named bar, if ever there was one just down the street a bit. This was kind of a classic dive bar with a bit of an Irish tinge to it. The bartender was friendly enough and everyone else was engrossed with racing on the television. The bar had a green linoleum top with a wood front and a black linoleum foot rest. Black metal bar chairs. The bar back was painted green with mirrors and with glass shelves in front and tiered shelves below holding the liquor. There is a shelf at the very top filled with sports trophies of various kinds, mostly softball or base ball and football. Nice rippled glass shaded lights hung above the bar. Little Jack-O-Lantern candle holders sat on the bar. There is a pool table in the back but it is pushed into a corner so there is no way you could actually use it. In the front is a bowling machine, and you don’t see too many of those anymore. They take up too much space I guess. Cobwebs decorated the ceiling and there was a twinkly Jack-O-Lantern behind the bar. Two guys at the bar had little walkie-talkie devices that they sat on the bar. When the went out to have a cigarette they both started chattering away and it was like sitting next to a couple of demented Furbies. 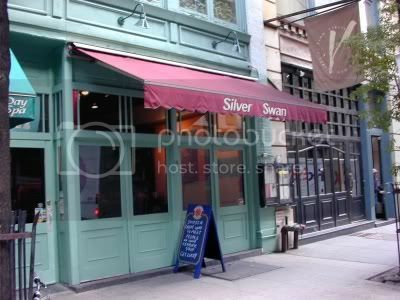 I had a bottle of Budweiser that cost me half-a-buck more than the Magic Hat #9 at Merrion Squres. Go figure. Heading downtown just another block at 1770 Second Avenue, at 92nd is this bar that has a lot of televisions, at least twenty that I counted ringing the entire place, plus a larger rear-projection screen in the back. .There is a good sized wooden bar, a bit beat up, with a brass rail. Black metal bar stools with black seats. The bar back is old wood too, with tiered shelves backed by mirrors. Large chests of ice sat underneath but I didn’t see anything in them but ice. The walls opposite the bar a re brick and there is a wide ledge against the end near the door that had bar stools in front. More tables in the back for dining. The food, or at least the chili, must be pretty good. The guy sitting next to me raved about it and said he comes in every Thursday for a bowl. In the back was one of those arcade type basketball shooting things, looked a bit out of place. I get the feeling that someone in the neighborhood who was a heroin addict had recently committed suicide by hanging himself. They were talking about heroin in Hooligans but I didn’t really hear that much of what they were talking about and certainly wasn’t about to interject myself into the conversation. Two fairly intoxicated guys in here were having a similar discussion and this time I got more of a gist of what it was about. I had a Bass Ale and headed on home. Another decent day with three bars hit. This makes 899 for the year and down to 101 to go. I will hit number 900 tomorrow and then the countdown of the final 100 begins. This is not quite as happy an occasion as I had hoped because it appears that Mr. Beckett Thomas, the individual that extended me the invitation to visit his bar, the Vanilla Room, in Sydney, Australia and had been assuring me, up until August, that everything was a go, has reneged on the offer, without even really notifying me. He seems to have just chosen to simply no longer respond to any of my emails asking for additional information. I will be posting more on this in a couple of days. I headed back again to an area near where I used to live and work again just to check out a place that I used to visit to see if it was still there and check out how it was doing if it was. I was pleased to see that it appeared to be thriving and remained just as I remember it. The more things change the more some things, at least, stay the same. On 20th between Park Avenue South and Broadway is this small, easy to miss place. 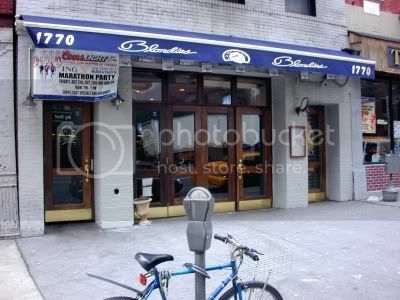 I used to duck in here for lunch on occasion and, interestingly enough, they had excellent grilled calamari. I say interesting because this is more of a classic German restaurant. It just has a narrow front with a maroon awning with the name in white letters. The bar top is wood planks framed by metal strips about an inch wide and an almost front edging of about six inches of dark pink and black marble that has a narrower raised wooden edging in front of that. The front is dark wood paneling with metal trim and there is a brass rail. The bar chairs are very ornate metal and are quite heavy. There are two ceramic beer stations on the bar and they each have four spigots pumping German beers. Behind the bar is a dark wood mirror backed breakfront with four rows of shelves holding a good selection of liquors and a few glasses. Metal coolers sit below along with more shelves of glasses. The walls are kind of a faded pumpkin yellow with about four feet dark wood paneling topped by a narrow ledge immediately opposite the bar. Small metal-jack-o-lanterns sit on top of the ledge. Interesting paintings grace the walls and, based upon the similarity in style, kind of smeary broad strokes, they are probably all by the same artist. Several small tables with white tablecloths up front and another dining area with forest green walls in the back. You can check out a small swan collection back there. I had a pint of Reissdorf Kolsch served, for some reason, in a Boddington’s pint glass. True Kölsch can only be brewed within a 20 mile radius of Koln and is supposed to be served in a specific type of glass, a tall, straight cylindrical 200 ml glass. Well, they got the beer right but the glass wrong. Right across the street is this small Japanese restaurant that bills itself as having both a sushi and a sake bar. Well, it did, after a fashion. The sake bar is up front and looks like it might have room for six chairs, but there were only two. The top had a metal top on one side and wood on the side toward the back. The wood side looked like it was being used as a desk with two calculators, a stapler, a scotch tape dispenser, and all kinds of paperwork covering it. The metal side wasn’t much better with a vase of flowers, two glasses filled with spoons, strainers, corkscrews, and stirrers, an insulated tea pot, an electric beverage warmer filled with sake, and a bunch of takeout menus. 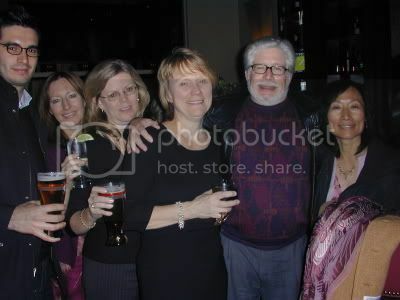 There was barely room for Bar Man and his drink. The bar overhung a back of what looked like narrow bamboo strips. No foot rest or anything. The two par chairs were light wood with green patterned cloth seats. On the left side of the bar was a glass shelf set upon four large sake bottles. Six large sake bottles were displayed on top. There is a knotty pine overhang above the bar with recessed lights and slots holding inverted glasses. Behind the bar are a couple of waist-high metal coolers with wine and liquor bottles sitting on top. Behind them are plain light wooden shelves backed by mirrors. These shelves hold more bottles and glasses. They do have a large selection of sakes. There are a pretty good crowd in here so it is probably a good Japanese restaurant and sushi bar, but a sake bar it barely is. Just a bit of trivia, hamachi is the Japanese name for yellowtail, a fish that is sometimes considered to be the equivalent of a baboon because of their bright red rear-end. I had a chilled glass of Kaori Junmai Ginjo. 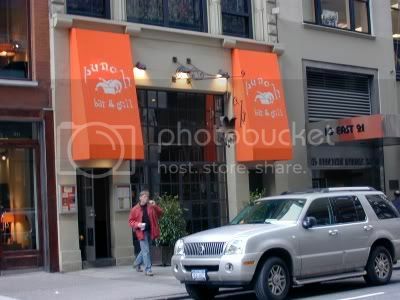 This is a large, dramatic Japanese restaurant on the corner of Park Avenue South and 18th. 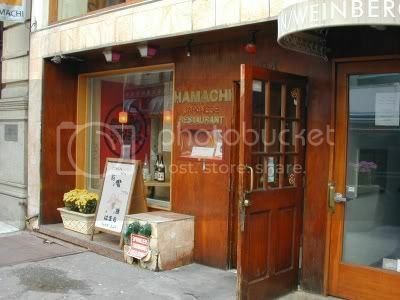 This is one of a chain of Haru’s owned by Benihana. I can’t remember what was at this location most recently, but this place is fairly new. They do have a good sized bar in here, smooth either highly polished wood or wood-grained plastic top with a textured black block front and a wooden foot rail. The bar chairs are light wood with dark salmon seats. Behind the bar are coolers, some with metal doors, some with glass doors. The ones with glass doors seem to hold mainly sake and glasses. 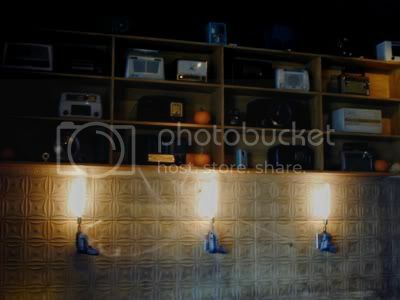 Above the coolers the wall is bright yellow plastic panels with three narrow glass shelves holding the liquor and sake. Above the yellow plastic is a black and white painting that reminds me of a haunted forest and this sweeps up and curves overhead. There are tall windows on two sides and a mezzanine dining area. As you walk through the doorway to enter the restaurant the first thing you encounter is water cascading down a large glass panel giving a waterfall effect. The sushi bar sits to the right of the drinking bar. There are fancy cushioned booth like seats and banquettes along the windows. This looks more like a late-night kind of place. I certainly hope so because it was kind of empty. Oh, by the way, Haru means spring in Japanese. I had a chilled glass of unfiltered Nigori sake. I quite like this milk white brew with a wee bit of a grainy mouth feel. It has been a bit nasty in New York the past couple of days due to the aftermath of Wilma. I just stayed in on Monday but even though it was still nasty I figured I better get out and hit at least a couple of bars, and so I did. Well, even though it was nasty outside I could at least tuck into a place and feel like I was somewhere a bit warmer. 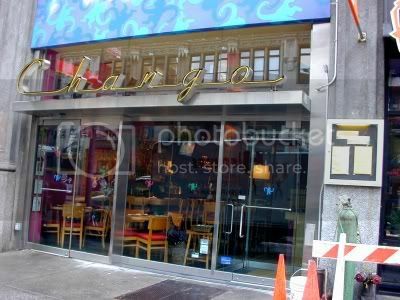 Chango fit the bill being a fairly fancy Mexican restaurant at 239 Park Avenue South. The glassed-in front is decorated with small, multi-colored silhouettes of monkeys, probably to keep you from walking into the windows. I will have to check to see if there are any monkeys in Mexico. The bar has a nice light wood top and a brick front and foot rest. The bar chairs are light wood with pink cushions. The wall behind the bar is brick painted a deep pink. Three wooden shelves mounted on the wall hold a large selection of tequilas and mescals. There is also a small tiered shelf that holds more standard liquors but tequila is obviously their thing. Above the tiered shelves is a mirror and above that a small flat screen television showing CNN. 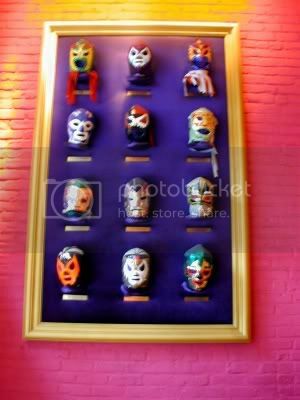 To the far left on the wall by the windows is a collection of Mexican wrestler’s masks, each with a name plate identifying the wrestler that wears it. I thought it would be neat if the television showed films of Mexican wrestling matches. Above the television is a shelf of clay pots. To the right of this is a set of three curved shelves with electric candles and below that is a few more bottles of liquor. A large, dramatic driftwood lamp sits on a counter just off the right end of the bar. The deep blue wall opposite the bar is lined with booths and fancy sombreros, mostly black with silver trim, hang above them. A row of tables and chairs runs down the center of the room. The back area has orange walls and there is a small balcony dining area as well. The ceiling is yellow with a wavy, cloud-like recessed pink area. 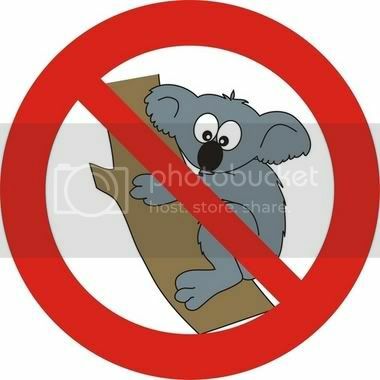 The floor is wood planking. I had a margarita, up with a salted rim. 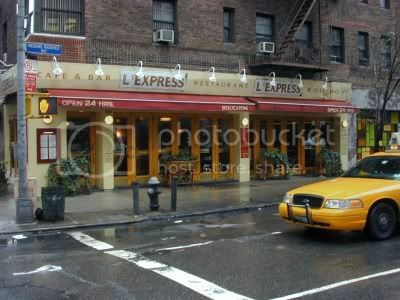 A great French bistro on the corner of 20th and 3rd that I used to frequent when I lived and worked in this neighborhood. It still smells great in here and is bustling but, alas, I am not here to eat today. The bar has a shiny metallic top with a light and dark wood patterned front. There is a foot rest and the dark wood bar stools have black seats affixed with brass-headed tacks. A large bouquet of flowers sits on one end of the bar. The bar back is mirrored with glass shelves holding liquor and glasses. Shades of Spain, there is a large espresso machine and, underneath that, a large selection of wines in an old wine rack. Two refrigeration units with glass doors hold a decent selection of beers (only one French beer though) and wines and champagnes. The lights above the bar have old fashioned looking clear, but rippled glass shades. They hang from a tin ceiling that looks old and distressed but is probably much newer than it looks. A few tin French advertising signs hang on the vanilla colored walls. The dining area is quite large and has that bistro clattering and chattering going on that lends an air of authenticity. No sidewalk seating where you can spend an hour or two sipping your drink and watching the passing traffic though. On the other hand, on a day like today you wouldn’t want to. I had a bottle of Chimay. I was hoping for a French beer but the only one they had came in a bottle much too large for Bar Man today. Not too bad for a miserable day. Two bars hit making 893 for the year and leaving but 107 to go. It was a pretty nice day today, sunny and a bit of a fall chill. Yesterday it was a bit drizzly and chillier so I decided to just stay inside. 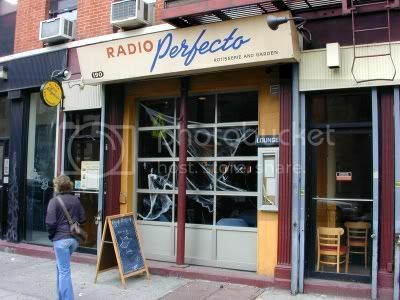 Radio Perfect is located at 190 Avenue B and, as perhaps you might guess from the name, there are a lot of radios in here, probably about fifty on the bar side and more in the dining area that is in the room next door. They look like they are from the 50’s and 60’s and sit on shelves mounted on the pale yellow tiled walls. The tiles have a raised pattern on them similar to what you see on old tin ceilings. The ceiling, on the other hand, is covered in what looks like red floor tiles. The floor is wood. Old overhead fans hang from the ceiling and there is a lot of track lighting with small spotlights. The bar is old wood with bar stools but now foot rail or foot rest. The bar back is kin of an assemblage of dark wood drawers and doorless cabinets down below with a slightly lightere wood framed mirror and recessed tiered shelves for the liquor. On each side of that setup are what looks to be homemade shelves of light wood that hold glasses, more liquor and, on the narrow shelves to the right, just papers and stuff. Bottles in dispensers sit on one side of the bar back and a set of empty dispensers sit on the other. 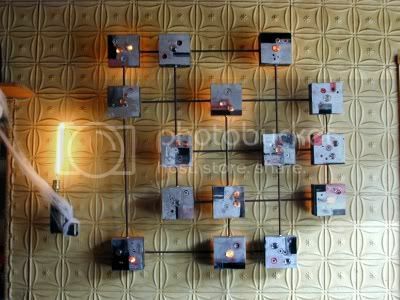 On the wall up front by the windows and across from shelves of real radios is a sculpture that looks like a bunch of little radios. The light fixtures on the walls are old power drills with long clear lightbulbs where the drill-bit would normally be. The place is decorated for Halloween with cobwebs and blood dripping from the top of the mirror. On the wall immediately opposite the bar is a mirror. I had a Hofbrau Munchen Octoberfest, quite tasty. Right next door is this crowded and noisy place with a small informal dining area up front and a small metal topped bar in the back. The bar has a wooden front, a foot rest, and old fashioned bar chairs with curved backs and armrests. The wall behind the bar is old brick, not that you can see much of it. Glass shelves filled with liquor bottles, two mirrors, one with an art-deco metal frame, and a metal beer station with six spigot cover most of it. Amongst the liquor bottles and next to a bottle of Ruma is one of those transparent medical models of a man outfitted with little blinking lights. To the immediate right of the bar are black and white photos of musicians, one of Joe Lewis, and movie stills. The larges movie still is of Marlon Brando on his motorcycle (a Triumph, not a Harley) from The Wild Ones. You might want to check it out, but I don’t think there were any Harley’s in that movie. There are a lot of pictures on the walls in here but none on the wall opposite the bar. There you have wood paneling toped by a ledge for drinks and short, ice-cream parlor type stools in front. Wall mounted lights with perforated metal shades hang over the ledge. The lights above the bar have deep inverted plate white glass shades. There is a lot of track lighting on the ceiling with small spots, similar to Radio Perfecto. I had a Bloody Mary. The Mysterious Chinese Woman had some kind of a smoothie and she said it was delicious. It was made in the open kitchen area in the back and looked like a malted milk. You needed a spoon to eat most of it. 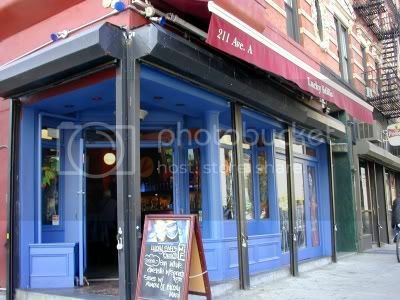 Over at 211 Avenue A at the corner of 13th is this friendly place with a dark brown wood wavy L shaped bar with brown and black bar stools. Orange walls with brown wooden pillars and wooden floors. The window frames and doorway are painted a dark blue. Behind the bar are a large L and a large S in a somewhat abstract style. The bar back with the liquor bottles is back lit with blue lights. Large globe lights hang from the ceiling over the bar and the small dining area in the back. 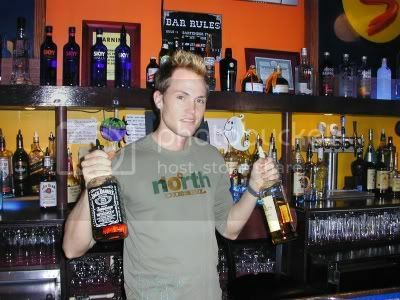 The bartender, Clint, was arranging yellow and orange flowers in small vases to for the tables in the back. There are two large flat-screen televisions over the bar and I got to watch the exciting end of the Vikings/Packers game. The Vikings managed to win with a 56 yard field goal as time ran out. There are a few Halloween decorations scattered about and a jukebox beside the doorway and a Pac-Man machine. The glass doors open onto the street and gives the place an airy look. I had a Bombay Gin Martini, shaken, not stirred. A decent enough day with three bars hit making 891 for the year and leaving 109 more to go. It would be nice to hit 910 before the month is out so that I can begin to take a bit of a breather. Can’t really be out carousing on Thanksgiving and Christmas. Well, I could be, but it would be best if I wasn’t. Mysterious Mother-In-Law wasn’t too happy with me on New Year’s day.